« DiningCity Week – 2017. From September, 14. out at the Corvin Cinema, Korda Hall in Budapest, presented by the Pannonia Entertainment. After 45 years the legendary Pink Floyd Live at Pompeii concert in July 2016, David Gilmour returned to the Roman amphitheater and, in a tour promoting the solo album “Rattle That Lock”, gave two consecutive concerts for 2600 lucky fans. 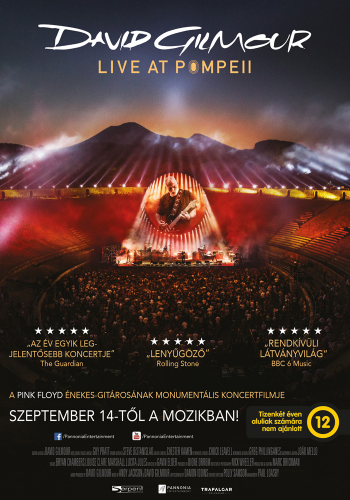 Gilmour has preserved the audio-visual performance of the monumental Pink Floyd concerts, while the concert featuring lasers and pyrotechnic tricks, projecting on a huge circular canvas, a live video mix made for this performance enhanced the concert of the selected songs. David Gilmour’s “all-star” band, which made up of excellent musicians, brought life to life on stage, including Pink Floyd classics such as “Wish You Where Here,” “Shine On Your Crazy Diamond,” “Comfortably Numb” , or “One of These Days” – the latter being the only one featured in Adrian Maben’s 1971 Concert Film. On both nights, the audience had a special performance in “The Great Gig In The Sky” from the album “The Dark Side Of The Moon”, which is rarely featured on Gilmour’s solo concerts. In addition to the classic Pink Floyd songs, the concert featured David Gilmour’s solo albums, Rattle That Lock and On An Island’s most successful compositions. Gavin Elder, the film director’s, double concert will be screened in September 2017, debuting in more than 2000 movie theaters worldwide.